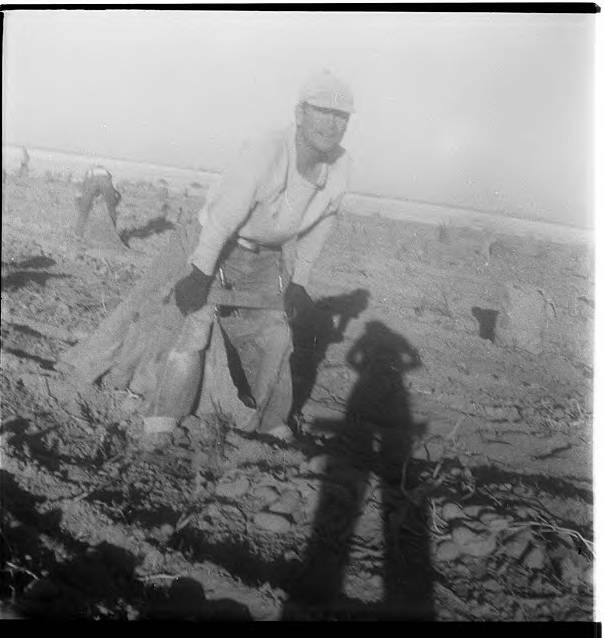 Black and white (overexposed) image of a man harvesting potatoes in a field. He stands with a burlap bag between his legs, the mouth of the sack attached at either end to a bar suspended from his belt loops, keeping it open. He carries empty bags attached to his belt at the back. While the field is bare and any visible plants are dried and apparently dead, unharvested potatoes can be seen laying on the ground in front of the worker. Behind him, another worker is bent over his own sack, and several filled sacks sit in the field behind them. Museum records identify the people in the image as 'potato pickers,' and they are most likely migrant workers. Migrant farm labor has been an important part of agriculture in Washington County since the early 1900s, though the cultural groups which provide the majority of the laborers have changed over time.